RICHMOND, Texas (KTRK) -- Watch out for critters on the move after a big storm. A Richmond resident spotted a big alligator taking a stroll in the rain in the 13000 block of Orchard Green, just off FM 1464. Major Chad Norvell of the Fort Bend County Sheriff's Office said a resident called them about the gator around 7 a.m.
Our ABC13 photographer captured this photo after the gator moved to someone's front porch. Deputies worked with Texas Game Wardens agents to capture the alligator and relocate the reptile. 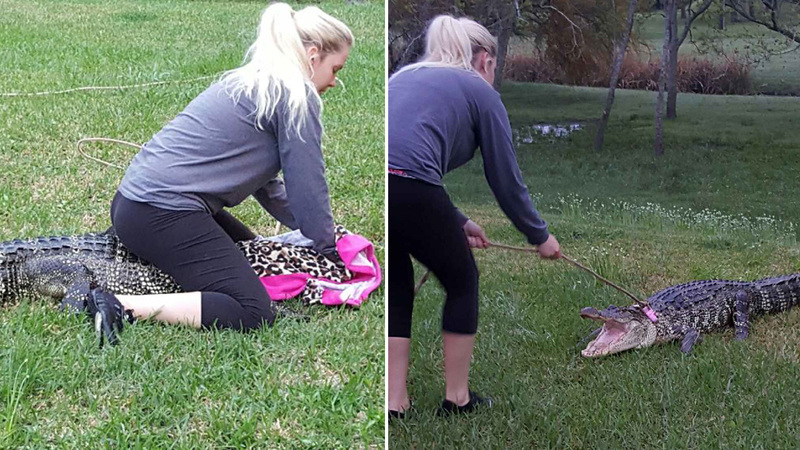 A Richmond homeowner got quite a surprise Thursday morning, finding an alligator on her porch as she went out to feed her cat.